What is it about yoga that just uplifts and resets you? Is it taking the time out for yourself or maybe it is slowing right down to hear your own heartbeat after rushing and rushing to get it all done. Tension melts away as your focus narrows and releases you from the intensity of your life. Your body is able to move and flex and finally feel that freedom of motion that time and deadlines keep stealing away. A few weeks ago I had the pleasure of meeting a lovely young woman named Jen Sceviour. She was fun and energetic and very passionate about Yoga and Muskoka together. 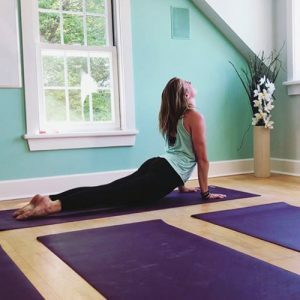 Simplifying yoga for the busy, her Port Carling Studio, Yoga 44, brings effective and mindful 44-minute sessions to cottage country, right across from Steamboat Bay, in the Healthfit building. They also offer travelling yoga service of private instruction bringing Yoga 44 right to your space, creating calmer and sharper minds without having to travel, find parking, pay for commuting and be away from your daily activities for 2 hours. Private instruction includes bringing fresh mats, props, and curated music to your private gym or dock.